This is WVI's Trustee Louise Heathcote latest Wildlife Creation that WVI supporters can have fun with. To celebrate the revamping of our Amur leopard project page, Louise has designed some fabulous Christmas baubles. "This month we are inspired by WVI’s commitment to protecting the rarest big cat in the world – the Amur Leopard" says WVI's Trustee Louise Heathcote; WVI is providing the essential veterinary support and training for Amur leopard conservation activities. Gold Glitter Glue pen or similar. Tear your white/cream tissue paper into pieces of approx 2cm/1 inch, don’t cut it with scissors. Paint a little of your bauble with PVA glue and add a piece of the white tissue, now paint over the piece with even more PVA glue. Don’t worry too much if you have creases and wrinkles, in some ways this adds to the overall effect. Continue this way until you have covered the bauble. Allow to dry on a plastic bag or sheet – you don’t want any sticking! You may need to repeat this process if the bauble has a very bright colour, the aim is to create a neutral surface. Tear your leopard print paper into 2cm / 1 inch pieces. 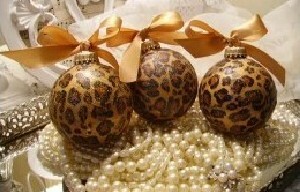 Cover your now dry bauble in the patterned paper using the same method as with the white/cream. Apply the gold glitter glue as desired and allow to dry. Attach the gold ribbon to the top and tie a bow.